Wallace Coastal Retreat is a private vacation home set on 35 acres of land, with stunning views of Wallace Harbour. Conveniently located in North Wallace, Nova Scotia on the Sunrise Trail, Wallace Coastal Retreat is situated just minutes away from Northumberland Links, Fox Harbour Golf Resort and Provincial Parks with long golden sandy beaches. This spacious 7 bedroom, 2600 square foot holiday home is bright and sunny, and features an open plan lounge, kitchen and dining room with views overlooking Wallace Harbour. This beautiful area of Nova Scotia, is known for beautiful sunrises, but sunsets are equally as breathtaking. The long golden sandy beaches are known to have the warmest waters north of the Carolina`s with water temperatures between 72 F to 74 F in July and August. 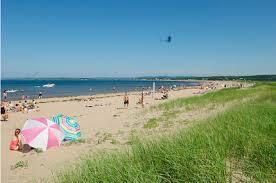 The beaches are just a 7- 20minute drive and there are at least 5 beaches to choose from . The swimming is excellent, as well as, canoeing and kayaking. Wallace Coastal Retreat is an excellent travel destination to get away from it all. Wallace, Nova Scotia is full of nature to explore with lots of space for children and adults to play in. Fresh lobster is available from the local wharf in season. Soak in the spectacular views of Wallace Harbour and watch the boats come in as you enjoy tasting the delights of home cooked food at McMahons Restaurant. All shops, bank, post office, groceries, liquour store, cafe and resturants are within a 5 minute drive. Looking to do some sightseeing? Side trips to Prince Edward Island, Halifax, Pictou, New Glasgow, Truro, Amherst, New Brunswick and Moncton, which are all within -1 - 1 1/2hours drive away. Discover our neighbours Pugwash and Tatamagouch village only 10 -15 minutes drive away. Other local attractions include Wallace Museum, Jost Vineyard and Winery, nature trails, bird sanctuaries, wildlife, Shopping, dining, fishing, boating and Ski Wentworth for the winter holiday makers.